With his face grotesquely swollen and his mouth unable to properly close due to the cartoonish size of his top lip, Israel Adesanya took a seat at the dais following his five-round instant classic against Kelvin Gastelum at UFC 236 in Atlanta and contemplated his journey to winning an interim middleweight title. Adesanya (17-0), the brash native of Nigeria who fights out of New Zealand, gave voice to all of the slights he has slowly compiled on social media from critics and trolls alike. Using them as fuel to embark on a spectacular six-win start to his UFC career that left president Dana White late Saturday comparing his rise to being "on a Conor McGregor-like trajectory," Adesanya was finally able to laugh last. "I know for a fact I'm the best in the world but no one is listening and I don't care," Adesanya said. "F--- the rest, I just have to do me. What are they going to say now? Wait until he fights someone, wait until he fights someone. I don't have to prove you wrong, I'm proving myself right every f---ing single time." With the way in which he fought, it's hard to argue with the 29-year-old former kickboxing champion who calls himself "The Last Stylebender." Unlike his previous performances, which included him showcasing his unique and mesmerizing striking style while dictating the distance and pace of each fight, Adesanya was forced to walk through hell against an insanely determined Gastelum in five of the most barbaric rounds UFC has produced in years. "Israel is flashy and Israel speaks very well but Israel became a star tonight," White said. It would have been one thing, however, had Adesanya merely survived the fight and held on for a close decision against the hard-charging Gaselum. Instead, it was Adesanya who thrived within the heat in the toughest challenge of his career thus far by seeming to find a new gear each time the bout took on a more violent turn. Not only was Adesanya on the verge of stopping Gastelum during an insane final minute of Round 5 on multiple occasions, he proved he had no trouble going to a dark place that few fighters end up going willingly. 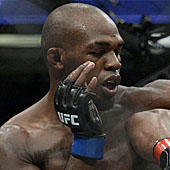 "I don't like to fight like that often but you need those so you know you can go to that place," Adesanya said. "I've been there before in training when it's put on you by six or seven or eight guys. I knew that if they couldn't break me then one man can't break me. It wasn't shocking. I didn't expect him to take me there but I was ready for it." If there was a true, gut-check moment for Adesanya during the fight, it came between the hellacious fourth and fifth rounds when he repeated a Nigerian Pidgin term to himself that best translates to a self-motivational mantra reminding him to employ the heart of a lion. Adesanya said he stood up and looked across the Octagon at Gastelum and essentially came to terms by "embracing the darkness" with what type of performance would be needed to win the fight. "I looked across from him and said, 'One of us is going to die in here,'" Adesanya said. "I was willing to die so I was willing to kill. If he takes me out, he takes me out but I'm willing to die in here. All those people saying I can't take a shot? F--- that. He couldn't even knock me out. "It's hard to explain. Only those who dare put themselves out there like we do will experience moments like that. These are legendary moments in time and history and I'm just so blessed to be apart of it. Like Dana said, a star was born. Again." With the win, Adesanya secures a shot at full middleweight champion Robert Whittaker, who is recovering from emergency surgery that pulled him from UFC 234 in February. White said the fight will "definitely" take place at a stadium in Australia although Adesanya is pushing for New Zealand, considering Whittaker is from there although he current resides in Australia. Either way, Adesanya has emerged as the kind of star the UFC can take worldwide. Not only is he a big part of the promotion bringing a middleweight super fight to the hungry Oceanic region, Adesanya now joins fellow Nigerian and welterweight champion Kamaru Usman as UFC's first African champions and said he and Usman are planning a trip back to Nigeria to celebrate. White also applauded Adesanya's willingness to fight when making the McGregor comparison and proudly told a story of Adesanya receiving the call about the Gastelum fight while on vacation. White said Adesanya not only accepted immediately, he left his vacation early to start training. Building a star is never an exact science and UFC has come close on multiple occasions with fighters who appeared to be the perfect candidate only for the unpredictable and brutal nature of the sport to have its way. From the way he talks to the way he fights, Adesanya oozes crossover stardom. But his dream of winning a UFC title never would have been complete had the substance on the inside not match the sizzle he flaunts on the regular outside of it. Finding a fighter with both is incredibly rare. "I'm not one to quit," Adesanya said. "I'm strong mentally. I'm bulletproof in the brain. And I'm f---ed in the head a little bit. I just know you're not gonna break me. I found something deep. I found like another level. I've been there in training before, but I found another level of just that darkness."